When you approach your bathroom design project, you may be sick of all the porcelain white bathroom layouts and the traditionalism that is associated with the space. Thankfully, there are myriad bathroom accessories available that can allow you to infuse the room with a dose of your decorative personality. Mosaic tile is quite possibly the most effective way of injecting color into a bathroom, and it's a lot less expensive than you may think. If you're looking for a simple pop of color, consider placing a border inside of your shower stall. When the color of your choice is juxtaposed against a white backdrop, it will become an instant focal point in the room. Another method of using tile is by replacing a painted accent wall with a series of vibrant tiles. You can create a dazzling pattern of your choice and use the tiles to flank your bathroom vanity. When combined with complementary bathroom accessories, window treatments, shower curtains and linens, you can craft a delightfully uniform arrangement. 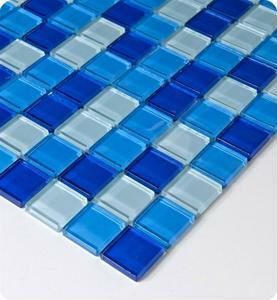 Mosaic tile is one of the most effective means of providing a splash of color for a washroom. What style tips do you have for homeowners who are interested in this decorative accent?